The law was passed despite an opposition boycott of parliament in December and comes amid the government’s growing sensitivity to online criticism. Responding to questions about leaked recordings of alleged conversations between CNRP Vice President Kem Sokha and a mistress, a spokesman for the Council of Ministers did not deny that the government was eavesdropping on opposition lawmakers. Rights group Licadho, which plans to release a legal review of the law this week, says the rules are likely to make the government’s heavy-handed response to online comment heavier still. “We’re in the middle of a widespread crackdown on online expression anyway; the law will add to this trend and potentially escalate the number of these types of cases,” Craig Bradshaw, a legal consultant for Licadho, said in an email. “It’s another aspect of the legislative control agenda ahead of the next election and sits alongside LANGO,” he said, referring to the recently passed Law on Associations and Non-Government Organizations, which has sparked similar fears of a coming clampdown on free speech. What worries Licadho most about the law is an article that criminalizes the use of any telecommunications equipment that leads to “national insecurity,” an offense punishable by up to 15 years in prison. He said the ongoing case of a political science student charged with incitement over a Facebook post calling for a “color revolution” was only the latest example of why Cambodians should worry about how the government interprets a threat. The article was all the more dangerous, he said, given the power the new law gives the government to eavesdrop on electronic communications without meaningful oversight. Licadho also worries about a pair of articles that requires telecommunication firms to provide the Ministry of Posts and Telecommunications with all of their service data—without the need for a warrant—and lets the government order operators to take unspecified “necessary actions” in cases of force majeure. 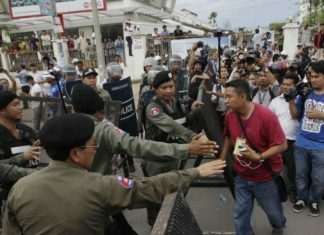 Pat de Brun, a legal consultant for the Cambodian Center for Human Rights, agreed that the Telecommunications Law, along with the NGO law and on-again-off-again plans for a cybercrime law, must be considered with the coming commune and national elections in mind. Khov Makara, a spokesman for the Telecommunications Ministry, said there was nothing to fear about the new law. He said the trigger for force majeure action and the government’s definition of national insecurity were both spelled out clearly in other laws, but that he could not remember which laws they were or what they said. The spokesman said the data the law requires operators to hand over was harmless. Mr. Makara added that his ministry was not involved in eavesdropping on communications and that the “legitimate authorities” vested with the power to approve such activity were at the ministries of interior and justice. Neither could offer an explanation of how this power would be exercised. Interior Ministry spokesman Khieu Sopheak said, “I’m not a lawyer, thank you,” and hung up on a reporter. Justice Ministry spokesman Chin Malin said he did not know who the “legitimate authorities” were, either, but would try to find the “technical experts” who did.